Hedgehogs are one of Britain’s most loved wild animals. But did you know that they’re in trouble, with numbers declining every single year? Here are some interesting facts about hedgehogs along with some suggestions about how to help them. Hedgehogs are found all over the UK. They live along the edges of woodland, and in hedgerows and meadows. They’re also often found in gardens, parks and other green spaces in cities. Hedgehogs use their long snouts to forage for insects, worms, centipedes, snails, mice and frogs. In fact, their diet has earned them the nickname ‘gardeners’ friend’, since it includes so many creatures regarded as pests. One hedgehog has around 6000 spines. Being nocturnal animals, hedgehogs have very poor eyesight. Instead, they rely heavily on hearing and smell to find their way around and discover food. Hedgehogs roam up to 2km in a single night in their search for food. A male hedgehog searching for a mate sometimes covers even more ground. Hedgehogs are also excellent swimmers. Hedgehogs usually live alone and come together only to mate. The babies stay with their mothers for 4-7 weeks before going it alone. Baby hedgehogs are called hoglets. And a group of hedgehogs is called an ‘array’. In Britain, hedgehogs usually hibernate over the winter. If you’re planning a bonfire from October onwards, always check to make sure a hedgehog hasn’t made its nest amid the leaves and twigs you want to burn. There are a handful of rare, blonde hedgehogs in the UK, who have black eyes and cream-coloured spines. Hedgehog numbers in Britain are going down. While it’s difficult to know exactly how many are left, some estimates suggest they’re declining at the same rate as tigers are globally – around 5% a year. There are lots of different factors contributing to this decline. 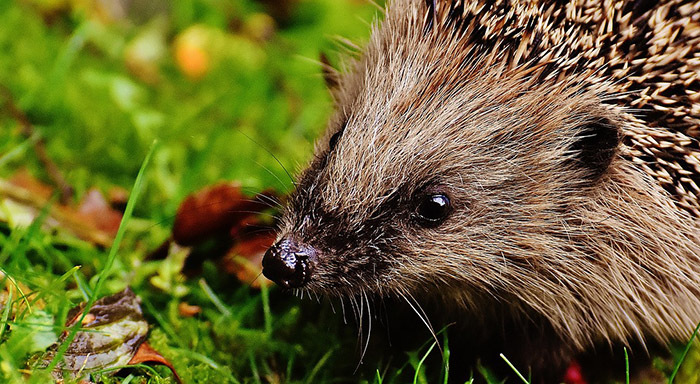 In the countryside, the use of pesticides means there are fewer insects for hedgehogs to eat. Bigger field sizes also result in fewer hedgerows where they can nest and forage. In cities, hedgehogs are losing habitat due to gardens becoming smaller, and more likely to be paved over with concrete. Fences and walls also make it harder for hedgehog to travel between gardens. And of course, many hedgehogs also die every year on roads. During dry or cold periods, you can help hedgehogs by leaving a shallow dish of water in your garden, and putting out food such as dog or cat food, unsalted nuts or meal worms. Hedgehogs are actually lactose intolerant, so don’t give them a dish of milk! Feeding hedgehogs is especially valuable in late summer and early autumn, to help them build up enough fat reserves to get them through hibernation in the cold winter. Make your garden hedgehog friendly with features such as log piles and compost heaps, which can provide a good place to nest as well as many insect for hedgehogs to eat. Leaving one section of your garden to become overgrown or wild can also help. A small pond can provide a useful water supply as long as it has at least one shallow side so hedgehogs can access it without falling in and getting stuck. Hedgehogs need to travel long distances at night, but more secure gardens are blocking their path. If you can, help create a hedgehog corridor by making a small hole under your wall or fence – around 13 x 13cm should be big enough. There’s more information on linking your garden here. If you find a hedgehog who is injured or seems ill, put on garden gloves and try to gently pick it up and place it in a cardboard lined with a blanket. Then contact the British Hedgehog Preservation Society for advice on 01584 890 801. Hedgehogs are currently facing a new threat. DEFRA has recently approved the use of new traps for “vermin”. Because traps are indiscriminate, it’s likely that many hedgehogs could also be killed in these cruel traps. You can find more information and get involved with the campaign to stop this here.